I had a lot of fun making these fritters – something I typically wouldn’t think of making. The use of turmeric goes a long way here and brings out the freshness in the zucchini, carrots and scallions. I made a few adjustments and have posted the recipe up for everyone to try! To find her original recipe, make sure you’re a member of the Inspiralized Community (click here to learn more and join for free!) and go to the April Recipe Challenge forum. The best part? You can win a $75 gift basket from Udi’s Gluten Free! Udi’s is our official sponsor of the Inspiralized Community Recipe Challenges and will send the winner a basket full of goodies each month for the rest of 2014. Enough about the challenge, let’s get back to this recipe. At first, I was hesitant to recreate this dish because it’s something that can easily be made with a cheese grater. Actually, there are plenty of zucchini fritters out there that are made that way. Therefore, I changed the recipe up a bit to really reflect the noodles – I wanted everyone to see the actual noodles. 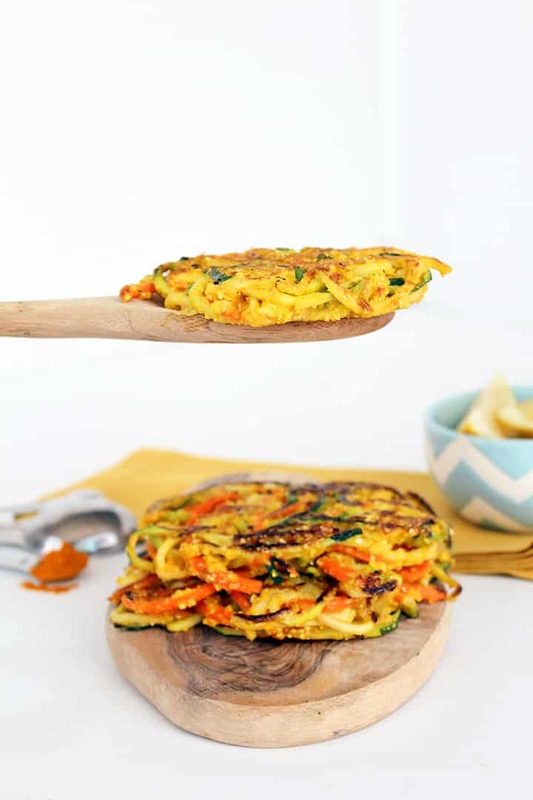 When you have more veggies and less cornmeal, you get a perfect balance of the savory, tasty cornmeal and the fresh, light zucchini and carrot. In Lisa’s recipe, she spiralizes and then “chops into smaller pieces.” Instead of doing this, use my half-moon trick from this post. 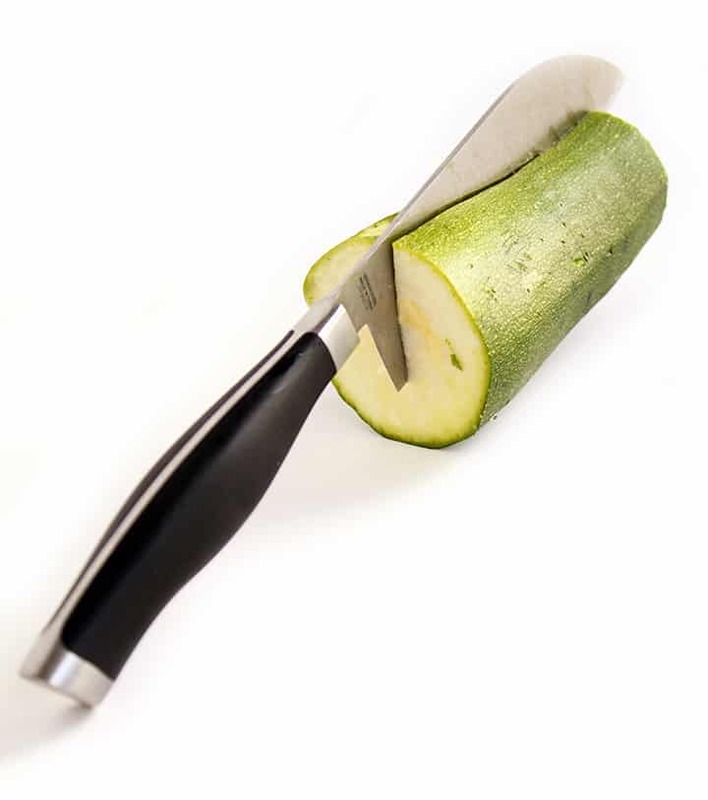 Simply slice your carrot and zucchini halfway through (careful not to go farther than that) and when you spiralize, the vegetable will break into half moons. This will cut out that additional step of chopping your already spiralized veggies and still preserve their spiral-like shapes. 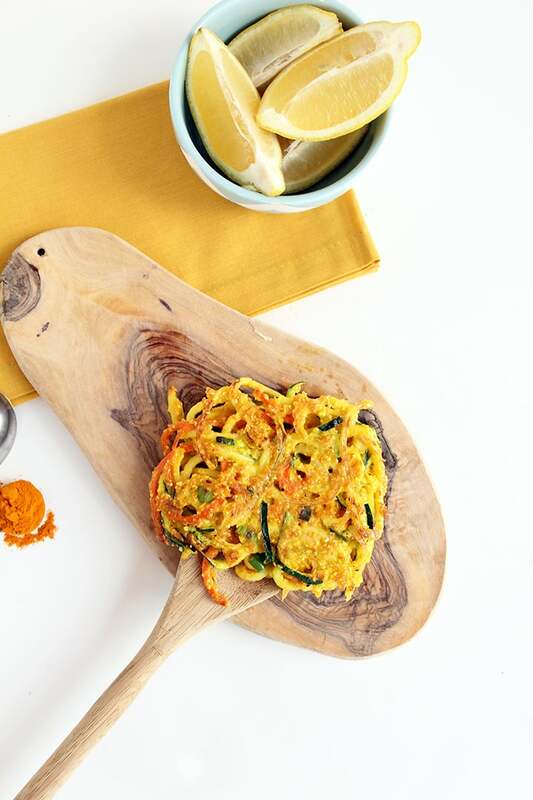 Other than that, Lisa’s recipe is fantastic – like I said before, the turmeric is the perfect seasoning for these cornmeal fritters. If you’re paleo, you can substitute in a coconut flour or almond meal. These fritters make savory buns for a burger this Memorial Day or even serve as a side, appetizer or base for a taco. Pile on the fish, corn, guac and you have an outstanding (yet unconventional) taco tower! Aside from this delicious recipe, I also have something else to announce: the Inspiralized iOS app is available again! To learn more about the app, click here. Prior to this update, the app was free. Unfortunately, the app was a free trial. In order to keep it live, I had to spend some of that hard-earned blogging money and therefore, I’m charging a small fee to make up for it: $1.99. Thanks for your support, and I know you’ll love the app – all of my recipes, saved to your phone! Slice your carrot and zucchini half-way through, lengthwise. Spiralize, using Blade C. Place your spiralized veggies, scallions, cornmeal, salt, pepper, turmeric, and eggs in a large bowl until thoroughly combined. Heat a skillet with 1/2 tbsp of olive oil over medium-high heat. Once the skillet heats, scoop out 1/4-1/2 cup of the mixture. Place it to one side of the pan and flatten the mixture with a spatula so that it resembles a small patty. Repeat and place on the other side of the pan. Fry for 2-3 minutes, flip over, flatten with a spatula and cook for another 2-3 minutes or until a patty is formed. Repeat until all of the mixture is used. Served! Yes - you MUST get a spiralizer! You can buy them quite cheap now, perhaps under $10. 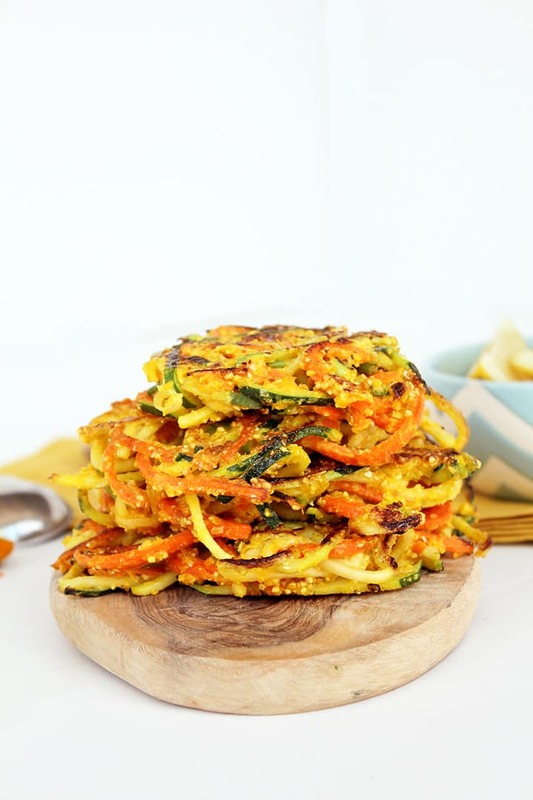 Love this idea of spiralizing.... and then making fritters! Need to get on this recipe asap! Thanks so much for the positive feedback, Lorna! Just made this for supper, except my zucchini had gone yucky just since I bought it on Sunday afternoon, so I used kohlrabi instead. We were full after two patties each, so the other half of the recipe is cooling on the counter. I bet they'll be good as a cold side, with maybe a tiny dab of maple syrup. Can't wait to get to tomorrow night's farmer's market! I made these today and doubled the batch as I'd like to serve them on the weekend. Can I freeze these? Unfortunately, they will become soggy when reheated! You can freeze them, if you don't mind that. Thanks. How long do you think they will stay fresh? I love this recipe. Super easy. I don't have the fancy spiralizer, so on the cheaper version - stick with the 'thin' spiral. I added garlic and will add more scallions next time; maybe even some finely chopped mushrooms or red pepper flakes. This is a fantastic base that can be customized to your liking. Loving this recipe.